Hydrangea Zorro – A newish form of Teller Blue Hydrangea with black stems. Produces deep blue lacecap flowers on acid soil just like ‘Blaumeisse’. The fertile flowers are pale blue, encircled by a small number of large four sepalled sterile florets. 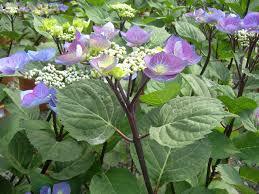 A strong robust plant which can also turn pink/mauve on neutral soil. Categories: Autumn, E-H, Featured Plants, New Plants for 2019, Plants A-Z, Plants by Season, Plants In Situ, Spring, Summer, The Bog Garden and Bank, The Cool Border. ‘Zorro’ is a rounded, bushy, deciduous shrub with broadly ovate, toothed, veined, dark green leaves and, from summer into autumn, distinctive dark purple-black stems bearing large, lace-cap heads of flowers, deep blue in acid soil, pink in alkaline conditions. A stunning lacecap Hydrangea, it does best here at Lewis Cottage in moist soil.